The LV3403B4 is designed to reduce first stage pressure of 5-20 PSIG down to burner pressure normally 11” w.c. Designed as a second stage regulator for smaller applications with flow requirements up to 450,000 BTU’s/hr, they are ideal for homes, mobile homes, and cottages. Large vent helps prevent vent blockage, it is tapped for 3/8”F.NPT for vent piping. 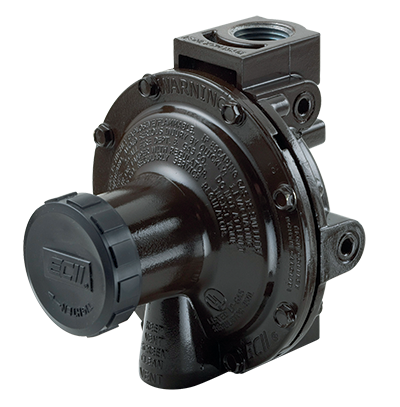 With 15 PSIG inlet pressure, the regulator is designed to not pass more than 2 PSIG downstream with the seat disc removed, per NFPA 58. Unique bonnet vent profile minimizes vent freeze over when properly installed. Built in pressure taps 1/8” F.NPT on both regulator inlet and downstream side of the regulator. Plugs can be removed with a 3/16” hex Allen wrench.